So, what’s so special about the newly released Beco Geminis? Echino… E-what-o? These limited edition Beco Geminis (only 200 of each were produced!) feature the extremely popular echino fabrics by Japanese designer Etsuko Furuya. Beautiful and and whimsical prints feature animal patterns, as well as the famous scooter and helicopter prints (gender neutral and urban chic!). The echino fabric is a medium-weight cotton and linen blend – 55% linen, 45% cotton. And, it’s not just a small panel of fabric, but the whole panel featuring the fun and funky colors and patterns, except Scooter and Duke, which still feature the center panel of fabric. Since there were so few produced, when you own one of these limited edition Beco Geminis, you’ll have a rare keepsake and a gorgeous carrier that will last you newborn through toddlerhood. Remember that the super comfortable Gemini can be worn front facing in, front facing out, on the hip, and on the back. 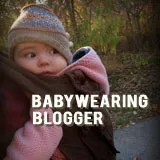 The unique snap-down sides narrow the body to allow tiny legs to be out, so baby can be well-seated in the carrier. With a 35 lb. weight limit, the Gemini will last you quite a while. Need some convincing? Here’s a picture of my 3 year old (albeit, a petite 3 year old at almost 30lbs.) in a Gemini back carry!